The missing piece of your family’s puzzle is probably somewhere in one of the books or microfilm available in this fabulous library. If only you knew where and how to find it! Novices in the genealogy world may hope that just by walking through the doors their family history will rain down upon them. Unfortunately, they often leave with their bubble burst and may feel like their trip was a waste of time. 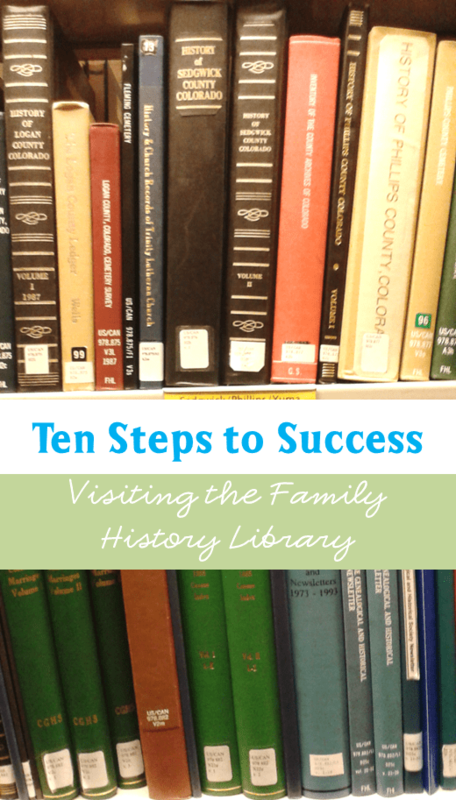 To help you find success on your first and subsequent visits to the FHL, I’ve written ten steps to follow. 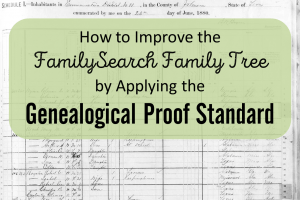 To read more about research planning and the genealogy research process I use to solve tough cases, check out my book, Research Like a Pro: A Genealogist’s Guide. Choose a specific ancestor or family to research. Review all the information that you have previously discovered and decide what else you would like to learn. For example, I decide to look for the family of my great great grandmother, Clemsey Cline. I don’t know her parents or any of her siblings. In reviewing the census records, I notice that in the 1850 census of Morgan County, Missouri, Clemsey and her husband have two children in their household with the surname of Cline. On the same census page is a Cline family. Is this a sibling? Cousin? I have no idea, but I want to find out. This is my only lead on the Cline family, so I’m going to start in Morgan County, Missouri. Before you even set foot in the FHL, you’ll want to check out the online library catalog. On this page you can decide what kind of a search you want to perform. 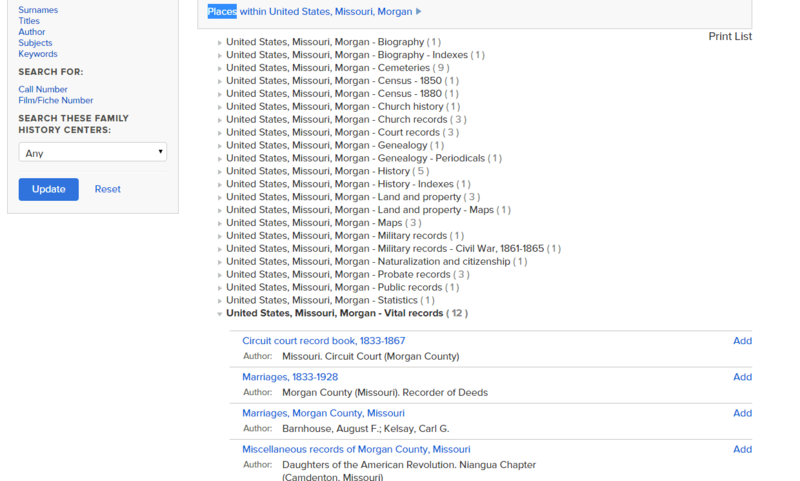 I want to see what kind of records are available for Morgan County Missouri, so I start typing Morgan, Missouri (don’t include “county”) and select “United States, Missouri, Morgan” from the results that come up. You can search for records of a city, county, state, or country. It is a good idea to survey the records for each of these jurisdictions because different records were kept at each level of government. I click the blue “Search” button to bring up a list of all the records for Morgan County Missouri. Now I can click on the individual categories to see specific records. I know Clemsey and the neighboring Cline family were there in 1850 because of the census record, so I want to look for other records close to that date. Under vital records, I see a variety of birth, marriage, and death records. Birth and death records were not regularly recorded until about 1900, so marriage records are the only vital records I am interested in. I also want to search land records, probate records, court records, and county histories. To save time, it’s important to create a list of all the records you want to search. I want to add the Marriage Records of Morgan County, Missouri to my research list so I simply click on the blue “Add” to the right of the individual record on the catalog. I continue looking through each of the topics to find records that fit my time frame of about 1840-1860. Each time I find a record that I want to search, I add it to my print list. The number of records I’ve added appears at the top of the page. When I’m finished, I click on the blue “catalog print list” to view and print. The call number for the books will appear but the film numbers are missing. This is because there may be multiple films for a particular record. After I print my list, I go back to the source for the films and write in the specific film I want to search. Any of the films listed as “Vault” films may take up to three days to retrieve. Go here for more information on ordering these films in advance. Step #4: Prepare – What to Take? My printed catalog list – this is the key to using the few hours available to me wisely. Flash drive – very important so I can save all of the information I find! Small notebook and pencil – just in case I want to take some notes instead of saving to my flashdrive. Lunch and a water bottle– a small cafeteria on the first floor has vending machines, but I like my own food and water. A small amount of cash – I might decide to print a record or purchase a treat! 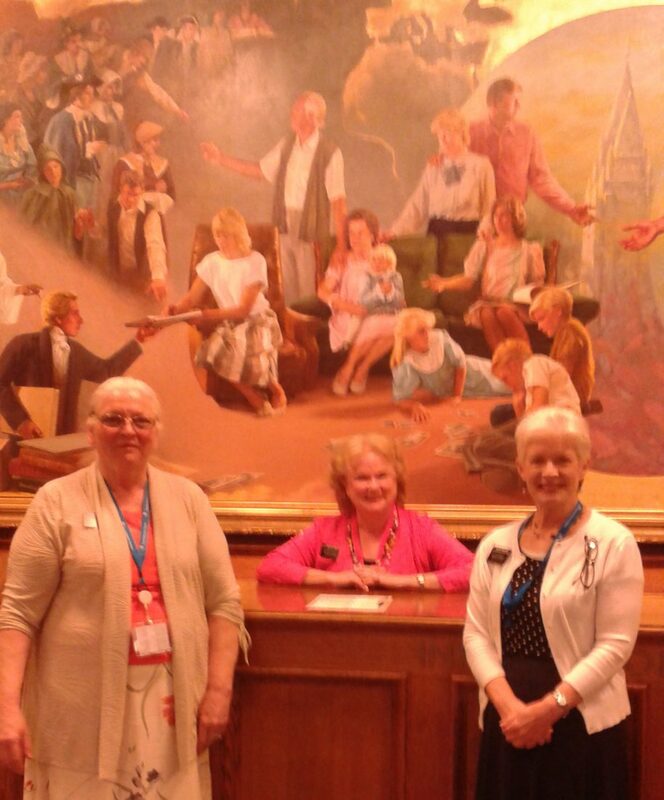 When you walk through the doors, you will see a general information desk and several Senior missionaries from the Church of Jesus Christ of Latter-Day Saints. Their focus is on helping you! If it is your first visit, go to the desk and ask for a sticker that will identify you as a newbie. 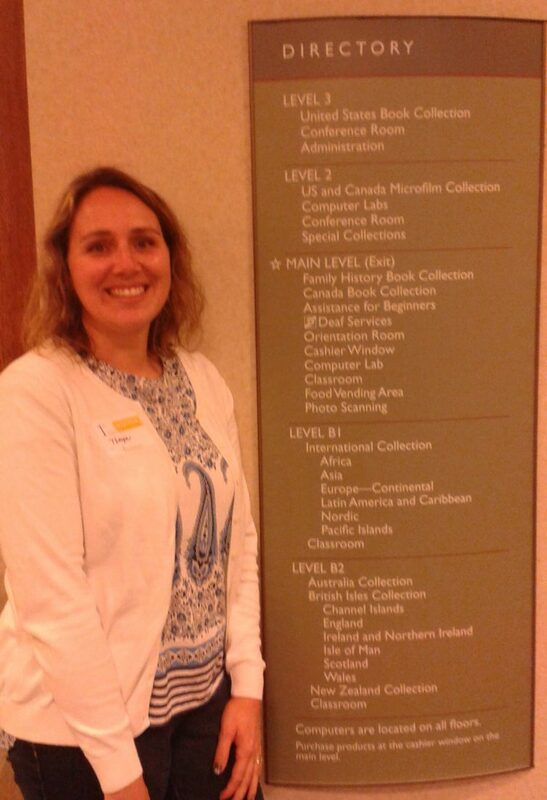 To the right of the general information desk is a directory showing the collections for each of the five floors. Here is my friend with her newbie sticker ready for some fun! If you show the missionaries your printed list, they will help you find the right floor if you’re not sure where to start. Look for the professional research consultants at the help counters on each floor. If you are searching international records, a professional will be a great help in reading the records and guiding your search. If you’re not getting the help you need, don’t be afraid to ask someone else! Everyone has different experience and knowledge. If you’re researching in the United States, it’s a good idea to start with the book collection because it’s easier and faster to search than the microfilm. Many times, a kind soul has indexed a set of records and printed it in a book. 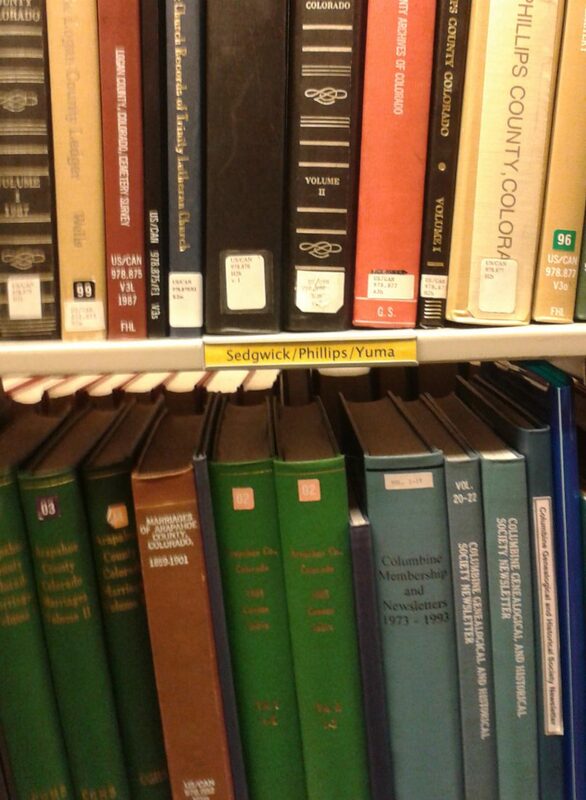 You can quickly look through the book to see if your ancestor made the cut. If you do find him in the index, then you can go to the film and look at the actual record. 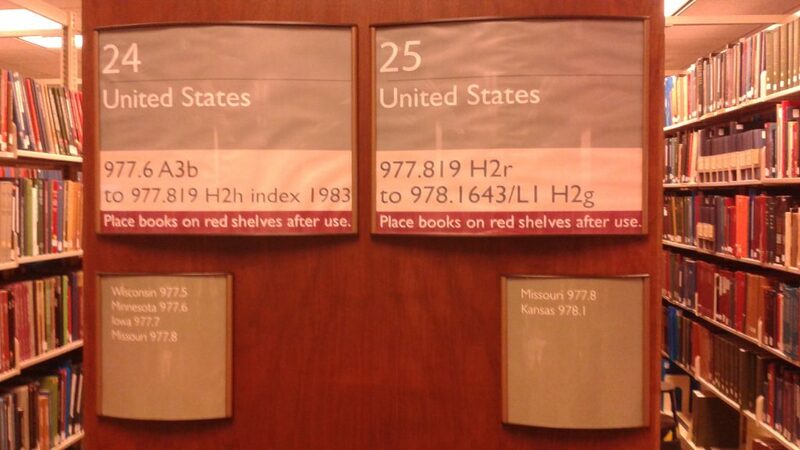 The United States books are organized by state, then by county. The counties are grouped by location within the state, not alphabetically. This is where your printed list will come in handy. Check the call number and you should find your county quickly. You might be tempted to check additional books not on your list and that is just fine! Serendipity is a huge part of genealogy. I often make great finds looking for something else! Just remember to write down the call numbers of the books and record your searches. Skip to Step #7 for tips on recording the information from your books. You’ve found an indexed record and want to look at the original record on microfilm. Or, your county or country doesn’t have many books and the majority of the records are on microfilm. Its time to try it out. 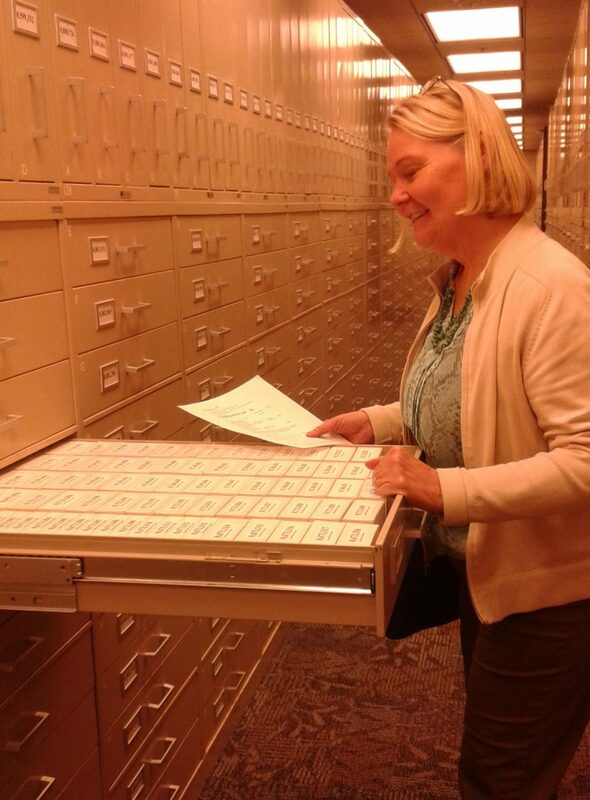 You’ll need to locate the floor of the library where the microfilm collection is housed for your area. Once there you’ll see large tan metal shelves with huge drawers. Using your printed research list, you can locate your film number. Take the film box from the drawer and head to a microfilm reader. Instructions on the front of the reader show you exactly how to load the film. If you can’t figure it out, ask your neighbor or one of the missionaries to help you. Search the film and then record your results! What will be the point of all of this searching if you don’t record what you did or didn’t find. If you don’t find your ancestor or family in the book or film, don’t be discouraged! Instead record NIL on your research list. NIL stands for Not In Location and is very important. You really don’t want to search that microfilm again, do you? Carefully recording your searches will save you much time and headache down the road. 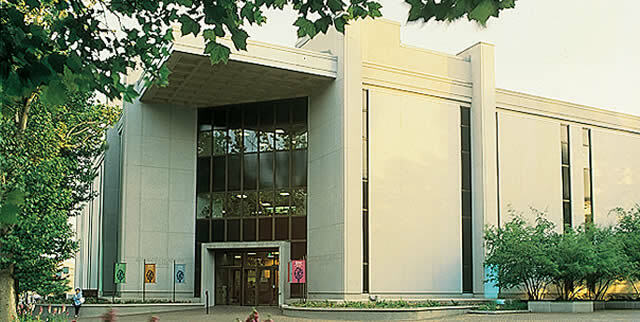 If you do find a record to save, take your book or film (take both reels off right where you found the record) to the copy center located on each floor of the Family History Center. A kind missionary will assist you in loading the images of the book or film on to your flash drive. You can also pay a very small fee to print a paper copy if that is your preference. Be sure to include the title page of the book with the call number in your saved images. You want to remember where you found the information. For a film, save the title slide at the beginning of the film. You’re home after an exhausting day researching. Take a break and when you’re ready, pull out your flash drive or printed copies and your research list. Start with one source that you searched. Permanently record the results of that search, including NIL searches. 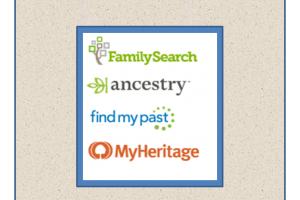 Enter new information that you found into your personal database and FamilySearch Family Tree. 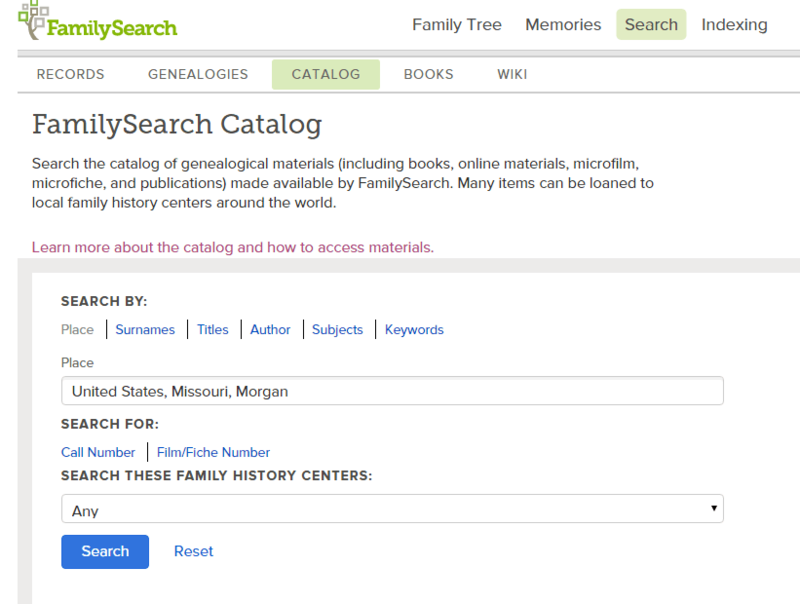 Create a source on Family Tree to share your discovery. 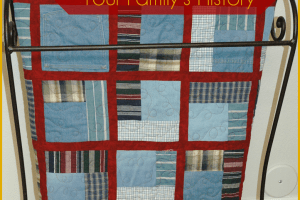 To learn how to add a source to Family Tree, see my post here: Creating a New Source on Family Tree. Now that you’ve recorded the information you’ve found, take some time to analyze it. Each record you found should open up more possibilities. This is a good thing! Did you find a witness on a marriage record that raised questions? How about some children on a will? Did a county history give you ideas about where your ancestors came from? What if you didn’t find the results you were hoping for? That’s okay! Now you know not to search that county for a marriage record, you can try a different county. After a few hours searching for my Clines, I had more NIL searches than actual finds. I did find a Cline marriage and a Cline cemetery with many names I can follow up on. Not finding the family in many of the records let me know that they didn’t stay and settle in this county. They probably stopped for a few years, then when land opened up further west they moved on. Now I can focus on looking for them elsewhere. While your research and analysis are fresh in your mind, take some time to make notes of what you’d like to search in the future. Don’t neglect this step! It will save you time in the long run if you keep your next visit to the Family History Library in mind. Writing good notes will refresh your memory when you return to your research after a few days, weeks, or even months. Here’s to many happy hours finding your family! I hope to come to Salt Lake City for my first visit next January, and this is a very useful list. Thank you so much! Sooooo looking forward to it! Good luck with your visit! I’m glad to help. Thanks, I appreciate the listing! Thank you so much for this information. It makes sense to have a plan and not go in blind-sighted. I went there one time and it wasn’t very productive, because I wasn’t prepared for one and I didn’t receive the help I needed for German records. Any advice about German genealogy? I do have some information from family, but I need a lot more. I can’t afford to hire a genealogist. Please help! After you feel more comfortable with German research as a whole and have located some specific records that you want to search at the Family History Library, then make your research list and plan your visit. At the FHL, head to the international floor and make sure you sign up at the help center for time with a professional German researcher. They will help you to read the records and may be able to give you advice on where to search next. 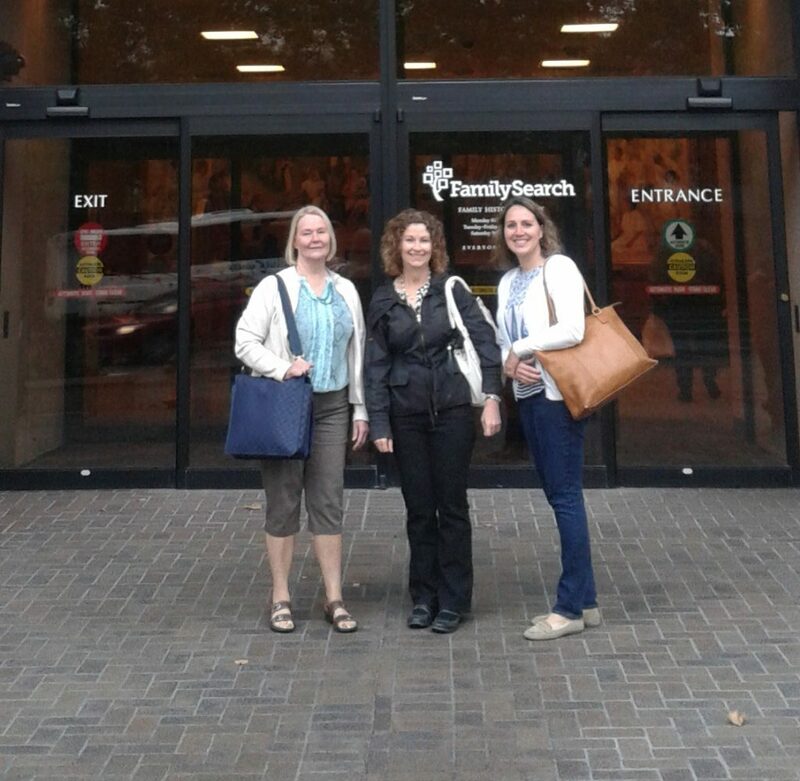 Thank you for the ‘success steps for visiting the FHL’. I’m going in September and I’m concerned that I won’t be adequately prepared but after reading your advice, I feel more confident. Good luck and have a great visit! I’m glad to be of help.